Life Puzzle—the Universal model to understand your SELF…and all others. The Life Puzzle came about by asking one question—what does a person need to know and do to build a whole and dynamic life? And that question came about when I realized that despite 12-16 years of schooling, we are not taught the answer to that question. We’re taught algebra and history and geography but little to nothing about how to be a whole human being. And as I said earlier—when I went to college to learn about helping humans, even there I wasn’t taught to understand what it means to be a whole human being. My own epiphany on this subject began through the door of nutrition. I basically ate anything and had no knowledge of nutrition at all. I was a junk food junkie and got away with it because I didn’t put on much weight—only at the same time, I was sick all the time, depressed, etc. Well, by a fluke a friend turned me on to good nutrition. I changed my diet and wow—got healthier, depression went away and I felt great. As I emerged from the fog of junk food eating, I got mad! Why didn’t anybody teach me good nutrition? It seemed to me, now that I was eating healthy that this was pretty vital information and yet, nowhere was I taught this despite years of education. That led to the next question—and this is how the Life Puzzle came to be: If “they” (whoever they are, right?) didn’t teach me about good nutrition—what else didn’t they teach me that I would need to know if I was going to have a healthy, whole life? Little by little the 16 core areas came together. If you look at them—you’ll realize that you have them in your life—but you probably don’t have much information of how to actively put them into your life. Financial responsibility. Everyone uses money! Yet, how much were you taught about managing money for your life? If you’re like most people—almost nothing! Relationships/Partnerships—most of us are going to be in a marriage or partnership but when were you taught how to do this? Most of us are clueless when it comes to making a relationship really work. I could go through all 16 core areas and you’ll see by the time we get to the last piece—Finding Meaning—which is about living life in relationship to death—that you’re missing information in most of them! Holes in our Wholeness. The Life Puzzle offers you a framework for Wholeness. In fact, it offers a framework for all 8 billion humans on the planet. We call it a Universal model because any one can use it no matter where they were born, what language they speak, how rich or poor they are. It’s open to everyone and it’s a way to understand your SELF and others. Every human being on the planet has the same 16 core areas, 5 edges that create the SELF and yet no two of us will put those pieces together in exactly the same way. So, it is a framework work we can all use but at the same time, we each, uniquely, put it together in a way that works for us. Thus, we have a common bond with every human on the planet yet we are all unique. I can use it to understand you and you can use it to understand me while we respect our similarities and differences. While the internal 16 core areas are what we work on throughout our adulthood, it is the 5 edges—Physical, Emotional, Thinking, Sexual and Spiritual—that are crucial parts of our childhood. We’re born without these edges or a formed SELF. 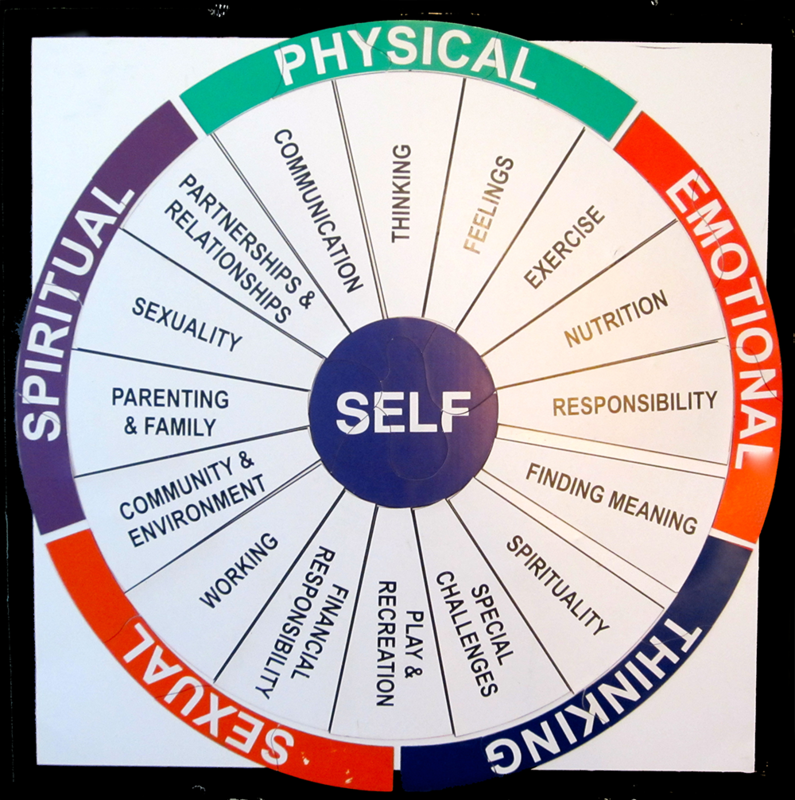 These 5 edges represent the developmental tasks necessary for building a SELF that is then capable of standing on one’s own and able to take SELF-responsibility when entering adulthood. We aren’t taught this either. You may not have been taught—but you can teach your SELF. Here’s the bottom-line. You weren’t taught Wholeness. But you can teach your SELF. The LPC is a place to start doing that. Through the coming soon, online school, you can take a series of short classes that will teach you the basics of how to put your Life (puzzle) together. These classes reflect the work I’ve done with clients for the last 20 years. They’re practical, tangible, and easy to understand. Designed to limit confusion—they’ll give you the ability to feel that you are capable of teaching yourself and applying it to your daily life. You’ll have tools that you can use over and over again to build your Life (puzzle). The Life Puzzle becomes a daily check-in framework that you can fall back on whenever you need to—especially in a fast-paced world that can leave you feeling like you’re spinning! When you’re going through challenging times, the Life Puzzle helps you ground it. Every challenging time is about learning to take that challenge and use it to grow your life. So you take the challenge and see what pieces are being impacted by it—and ask, “What do I need to learn to get through this?” It gives you perspective that even when things are really tough, it’s about discovering which piece or pieces need attention so you can emerge beyond the challenge and add to your wholeness.